Washington – The inauguration of President-elect Donald J. Trump and related events may bring a record number of Connecticut residents to Washington, both to support the swearing in of the 45th president and to protest policies they expect him to implement. Connecticut’s congressional delegation has distributed more than 1,500 tickets to those who want to be up front on the Capitol lawn to see Trump take the oath of office on Friday. “It’s going to be a tremendous honor to witness the peaceful transfer of power,” said Rep. Anthony D’Amelio, a Republican who represents Waterbury in the General Assembly. 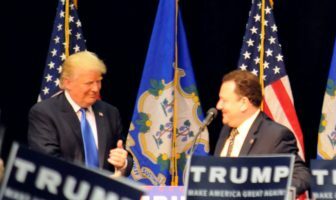 D’Amelio was the first elected state representative to endorse Trump and was honored by the president elect during a rally last April in Waterbury. “He called me up on the stage, which was pretty cool,” D’Amelio said. He is attending the inaugural events with his wife Joanne and his son Anthony and also will take the opportunity to spend time with his daughter Krista, who lives here. J.R. Romano, the head of the Connecticut Republican Party, will also attend the inauguration. 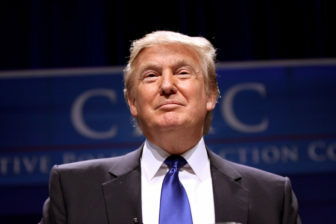 He arrived in Washington this week for a Republican National Committee meeting and will stay for the festivities. “It’s been a little bit of a whirlwind and very exciting,” Romano said. Many Connecticut residents in Washington this week will attend an inaugural ball. Washington loves to mix parties with politicking and an inauguration provides fertile ground for that. The practice dates back to the first president. On May 7, 1789, one week after the inauguration of George Washington in New York City, sponsors held a ball in his honor. But it was not until 1809, when Dolley Madison held the first inaugural ball for James Madison at the Capitol, that the tradition of the official ball began. Donald Trump invites Rep. Tony D’Amelio, R-Waterbury, onto the stage during an April rally at Crosby High School in Waterbury. D’Amelio will be attending the inauguration. On Friday night, Trump and his wife Melania will attend the official balls, called the Liberty and Freedom Ball and the Salute to Our Armed Services Ball. There are more than a dozen other unofficial balls and parties scheduled to celebrate the inaugural, usually sponsored by special interests. Most of the unofficial balls are organized by state societies, non-partisan social organizations that provide expatriates of states who live in greater Washington with venues for a wide variety of receptions, dinners, picnics, ceremonies and charitable events. The Connecticut State Society joined other New England states in organizing a ball eight years ago, but hasn’t held an inaugural ball or party since. While Republicans are celebrating retaking the White House and control of both chambers of Congress, security for the inauguration will be tighter than ever because a record number of inaugural protesters are expected. Trump will recite the oath of office, administered by U.S. Supreme Court Chief Justice John Roberts, at noon. He will use President Abraham Lincoln’s inauguration Bible, as well as the Bible that Trump’s mother gave to him at his Sunday school graduation in 1955. Afterward, Trump will deliver his inaugural address. Just before Trump takes the oath, Vice President-elect Mike Pence will be sworn in by Supreme Court Justice Clarence Thomas. Those on the stage with Trump and Pence on the west front of the Capitol will include members of Congress, Supreme Court justices and former presidents Jimmy Carter, George W. Bush and Bill Clinton, as well as Trump’s election opponent Hillary Clinton. About 60 members of the U.S. House of Representative are boycotting the inaugural ceremony, many of them angered by Trump’s clash with Rep. John Lewis, D-Ga. But every member of the Connecticut congressional delegation – all Democrats – plan to attend. Members of the U.S. Coast Guard band practice for the inaugural at the academy in New London. “While I respect different decisions made by others, I will attend the inauguration out of respect for our nation’s peaceful transition of power and as a part of my official duties,” Sen. Richard Blumenthal said. Connecticut Gov. Dannel Malloy said he also will attend, although his initial inclination was not to come to Washington. Then the new president and vice president will make their way along 1.5 miles of Pennsylvania Avenue from the Capitol to the White House, trailed by some 8,000 parade participants. 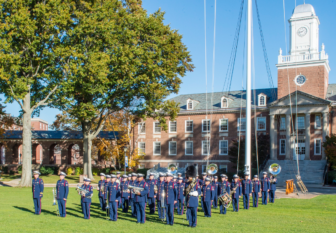 Connecticut will be represented by the Coast Guard marching band and a 90-member cadet corps. Four years ago, at President Obama’s second inaugural parade, Connecticut had one float in the parade. It was a 1916 Ford Model T ambulance painted “French infantry blue” that was driven down Pennsylvania Avenue by George King III of North Franklin. King said he submitted a request to participate in Friday’s parade, but was turned down by the inaugural committee. Like other inaugurations, this one will draw protesters. Many of them are coming to Washington for the Women’s March on the day after Trump is sworn in. Organizers say about 4,500 marchers will come from Connecticut for an event that is expected to draw about 200,000. The march started with people responding to a Facebook event page created by retired Hawaiian attorney Teresa Shook on election night. “It’s just ingrained in every fiber of my being, I could not think of not going to the march,” said Amanda Fischcetti, a 32-year-old mother of three who lives in Union. 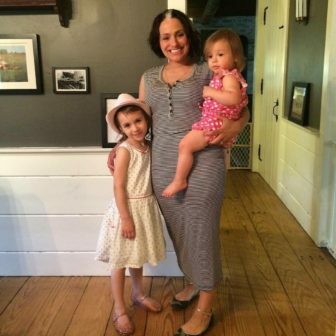 Amanda Fischetti of Union, plans to join the Women’s March in Washington on behalf of her daughters. She said she was prompted to join the protest because she is concerned about “a lot of scary stuff that’s coming down the pike” in the new Trump administration. Like many marchers, Fischetti is concerned about a rollback of women’s rights and civil rights. The part-time teacher is driving to Washington with her cousin, aunt and best friend. But many are taking buses that will take them to Washington, D.C., in the morning and bring them back in the evening, paying from $50 to $70 for a round trip fare –depending on the pickup point in the state. Women’s March organizers in Connecticut say they have filled 80 buses, and churches and other groups have filled others. She joined in the protest at former President Richard Nixon’s inauguration in 1969. This one is expected to be much larger. Sister marches are planned for all 50 states and in 32 countries around the world. The ones in Connecticut will be held in Stamford, Hartford and several other towns. Kathy Cross, 59, of Simsbury, is marching to try to safeguard “basic human rights” which she said are “under threat” by the Trump administration. Sarah Raskin, a professor at Trinity College who helped organize the march in Connecticut, said the protest has three goals. One is to provide a support group for people “who no longer recognize the country.” The second is to make it clear to the Trump administration and congressional Republicans ‘”that there are a lot of us,” who disagree with their agenda. The third reason for the march, Raskin said, is to begin organizing a movement of opposition. The marchers will be supported by the members of the Connecticut congressional delegation. Some, including Blumenthal and Reps. Joe Courtney, D-2nd District and Elizabeth Esty, D-5th District. Sen. Chris Murphy plans to babysit his two young sons so his wife can march. The five members of the U.S. House of Representatives from Connecticut also have organized a reception in the Rayburn House Office Building for the marchers from the state.